It’s Day 4 aboard the Beagle, and the crew has full confidence in Captain Fitz Roy… Okay, I’m not Charles Darwin, but, I am reading two very inspiring books while on this cruise. First, as this is my first scientific voyage, I am revisiting Darwin’s trip aboard the Beagle to channel some of the wonder and “magic” of that extended journey. The other book I’m reading is the sequel to my favorite book, The Evolution of Calpurnia Tate. If you teach G4-G8, I highly recommend you get to know “Callie Vee.” The book is a wonderful bit of historical fiction that details the life of a young woman/girl in central Texas in 1899 who wrestles with her interest in science and the conventions of “proper” society. 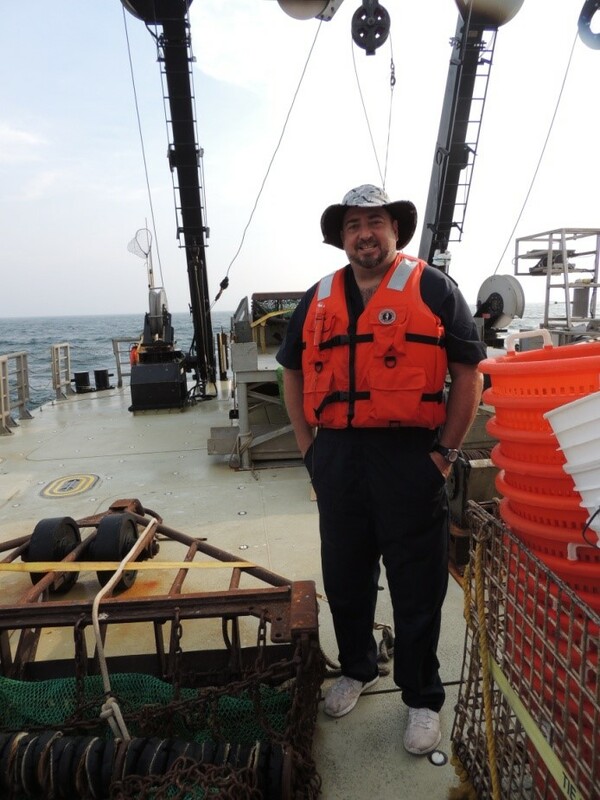 Thus far aboard the R/V Hugh R. Sharp we have enjoyed favorable seas, good food and very welcoming company. 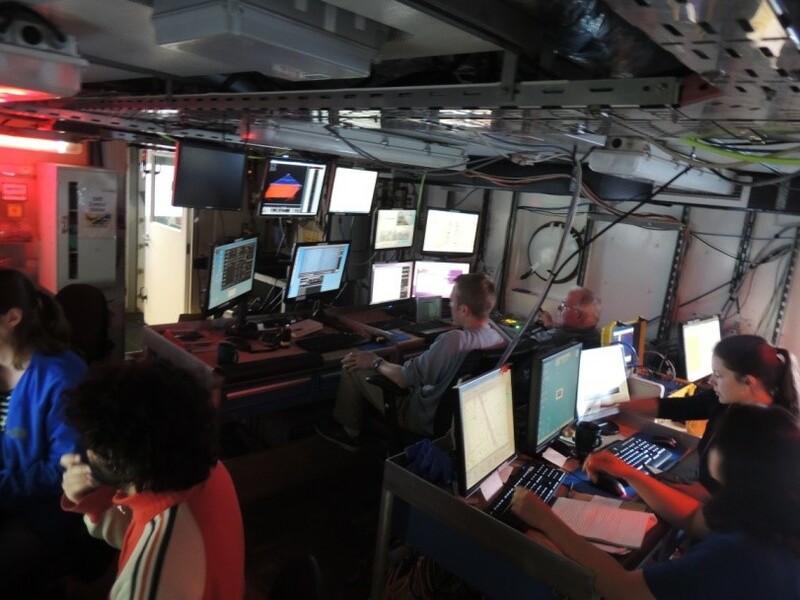 Shifts for the science-crew last 12 hours and run 12-to-12, and there are about six people assigned to each shift (note: the captain and ship’s operational crew keep a different schedule.) I am on the day shift, so I work from noon to midnight — which I imagine would fit quite nicely with the schedule many of my students are currently keeping now that they are on their summer break! 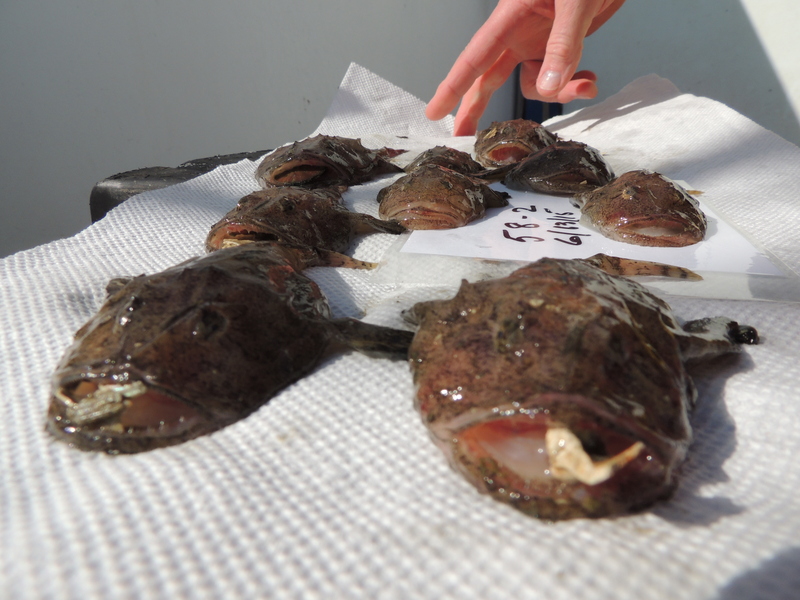 Our mission is primarily to perform a scallop survey, moving from point to point while making observations related to population densities and spatial distribution. Late in the cruise we will be doing some exploratory work in an effort to better understand the lobster populations in this area of the Atlantic Ocean. 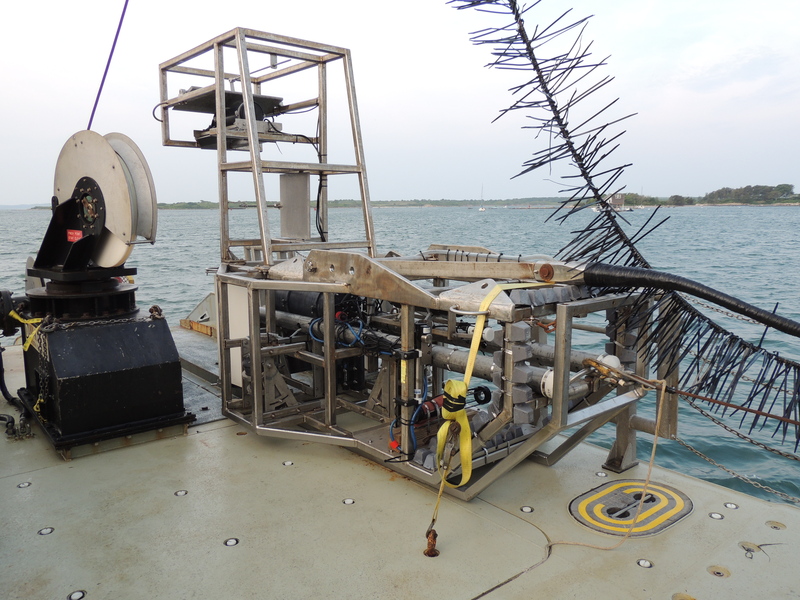 Our work centers on two primary observation methods: habitat camera (aka – “HabCam”) and dredge. Atlantic sea scallops are a bivalve, along with clams, mussels, oysters, etc. that can get up to about 200 mm (about 8 inches) across, and most three year olds are in the 80-90 mm range. Commercially, they are targeted between 4 ½ – 5 years old. 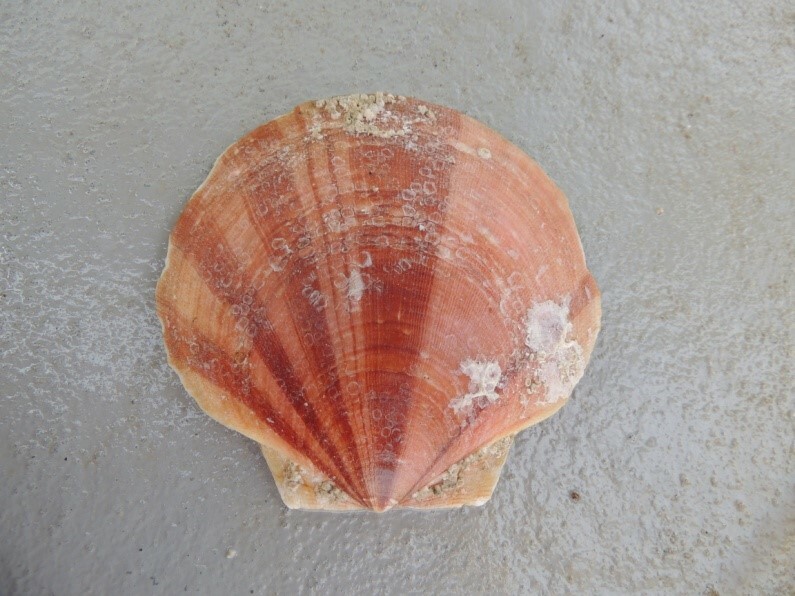 Scallops feed by filter-feeding through their mantle, which is housed inside the beautiful orange and white outer shell. Scallops move using a form of jet propulsion that makes it look like they are swimming (they “bite” at the water as they propel themselves up from the seafloor, pushing the water out of the openings near the umbo at the back of the scallop shell). The physics changes as they get bigger, so it gets more difficult to push themselves off of the sea floor, but the little ones can get up to about 10 feet off the bottom of the sea floor. Natural predators of scallops include various species of starfish, such as Astropecten and Asterias. 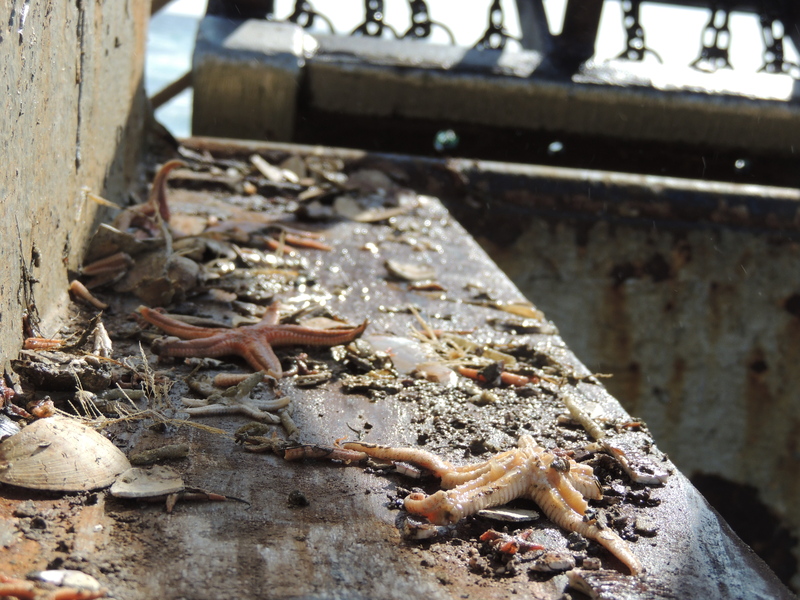 These starfish use distinct predatory tools. The larger starfish, the Asterias, has a hydrologic musculature that allows it to essentially pull apart the shell of the scallop, inject digestive enzymes (aka – “putting its stomach inside the scallop”) and enjoy! The Astropecten is quite different because they completely engulf the scallop and digest it internally. 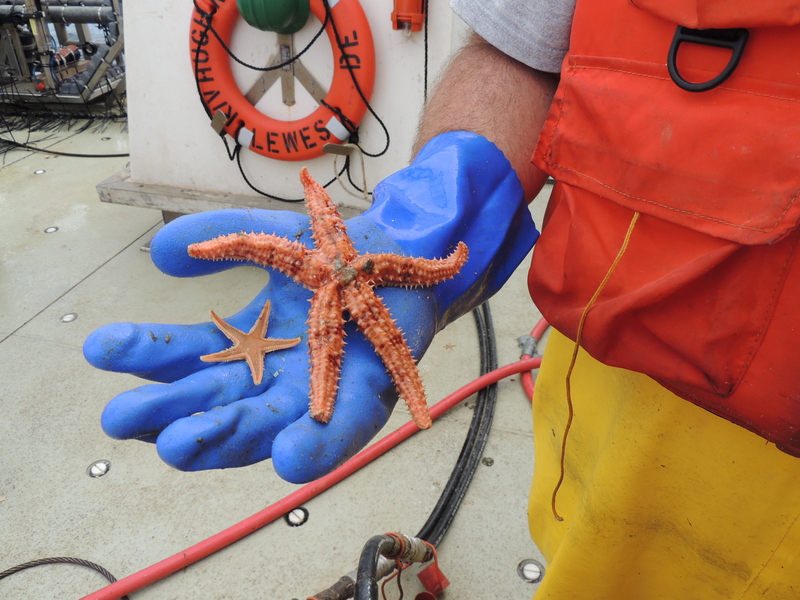 The two types of starfish target different-aged scallops: Astropecten eat them when they are small enough to be fully engulfed, and Asterias when the scallops are older and the shells are larger and harder, making it too difficult for digestive fluids to assist with the process. Other predators of the scallop include humans and Cancer crabs. NOAA has been conducting these surveys for approximately 40 years. Before the mid-1990s, scallop fishing was largely unregulated, meaning that commercial and private fishers could operate anywhere at any time. In the 90’s, the government started to use various management tools to support population sustainability through efforts such as limiting the number of people allowed aboard a commercial vessel, limiting the number of days available in a season, changing the ring-size used on the dredges to catch the scallops and closing fishing areas on a rotational basis. 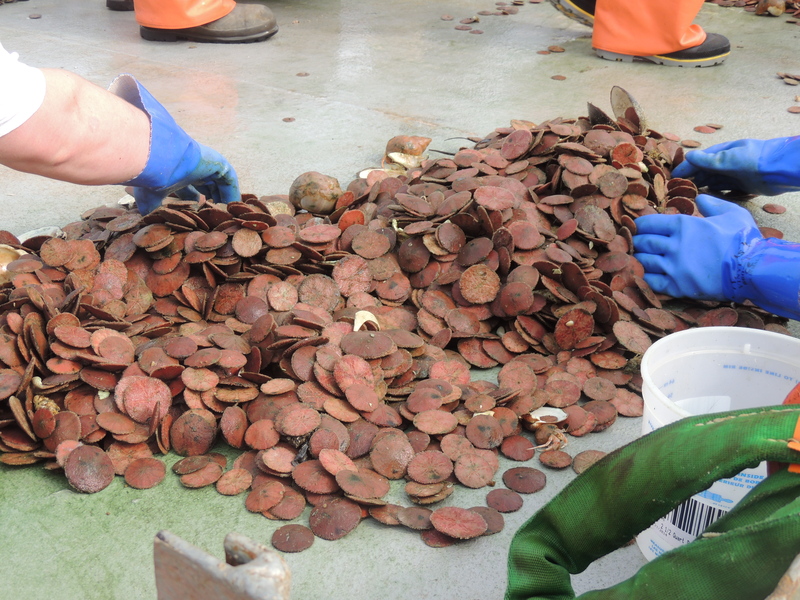 The commercial fisheries have also set aside funds that are used to support research that will help keep the scallop populations healthy. The first day of the cruise was spent steaming out to the first observation point while getting the HabCam system running on all cylinders. The HabCam (pictured below) is a 3,400 pound, steel-framed “camera cage” that is towed behind the vessel as it moves (we’ve been traveling at about 6 knots) through a determined course in areas that have been observed using the camera for the past four years (note: dredge surveys in this area have been conducted for the entire 40ish year period). We moved towards the south for the first two days along the Great South Channel and are now heading east along the southern edge of Georges Bank. 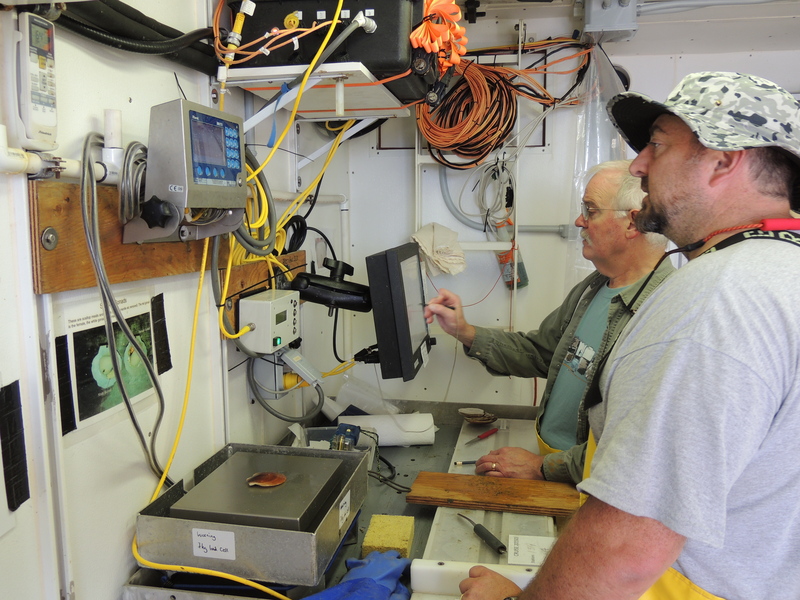 The science crew uses three primary areas aboard the vessel: the back deck, where all dredge-related operations are conducted; the wet lab, where samples are weighed and measured; and a dry lab, which houses about 25 computers that run various programs relating to everything from weather to analyzing the positioning of the dredge underwater. Over the first two days, I (tried to!) 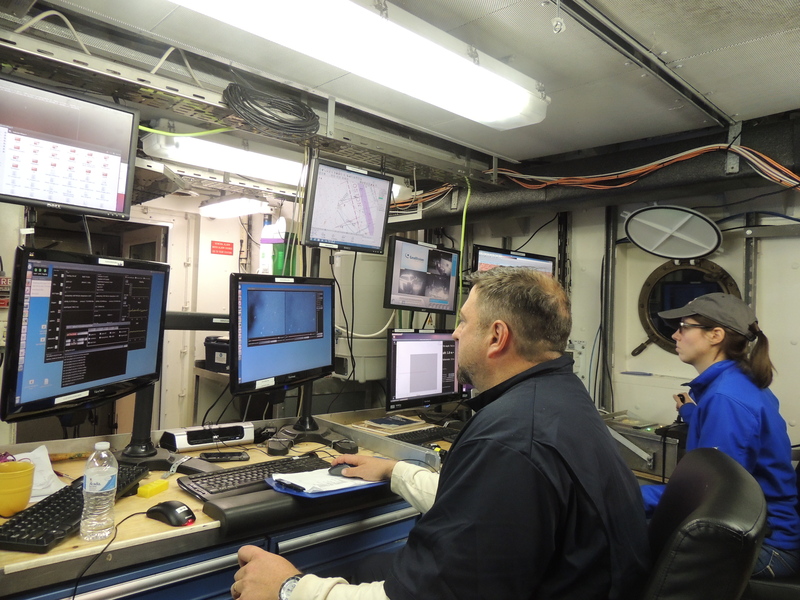 learn how to drive the HabCam, keeping it about 2 meters off the bottom of the seafloor. The seafloor in this area has been a relatively smooth mix of sand and shell hash, but, there are naturally occurring topographical changes that require the HabCam driver to remain constantly vigilant and adjust as appropriate. There are two cameras on the HabCam and they are set to take 6 photographs per second (standard sample rate). The two cameras give a scientist the chance to view images in 3-D. This point is important when you remember that scallops swim, which means scientists can use the 3-D imagery to tell whether the scallops are in motion or stationary when photographed (as well as how far up in the water column those scallops are swimming). At 6 shots per second, there can be millions of photos taken over the course of a season (likely 8,000,000 pairs of photos over 4,000 km of track this year! ), and NOAA scientists are recruiting YOU, dear Citizen Scientists, to help filter through the photographs through websites like projectfishhunter.org (set to launch this fall) or seafloorexplorer.org, which is a project started by one of the scientists on this mission, who is a researcher and professor at MIT/Woods Hole Oceanographic Institute. My students will find a parallel between the HabCam and the six game cameras we have set up in our Preserve that take 3 shots in succession when triggered. We monitor those cameras weekly and depending on traffic and false hits due to wind-noise, we could have as many as 2,000-3,000 photos on a camera in a given week. Can you loan me five (sand) dollars? Dr. Gallagher using a 3-D handheld camera (wow!) 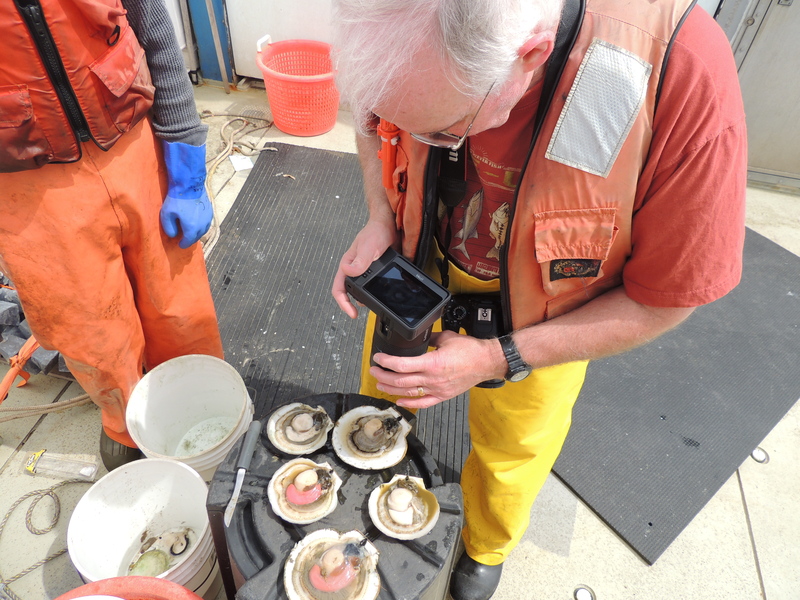 to take pictures of male and female scallop. The ones with the bright pink are the females and the white and grey are males. At Mother’s Café in New Orleans, they’d call this the makings of a debris sandwich. 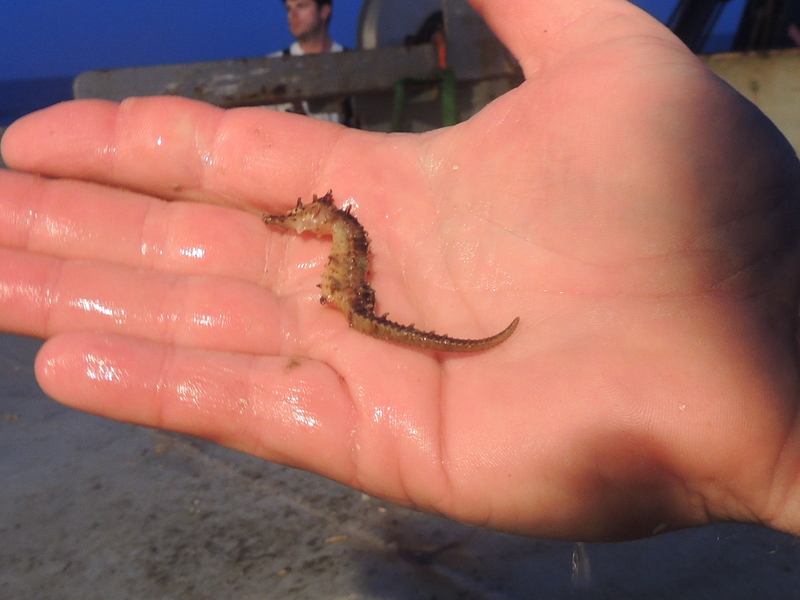 We caught this little seahorse and I know my daughters will have a million questions about it! In Cajun parlance, “lagniappe” means a little something extra. In my classroom blog I include a “lagniappe” section at the end to help extend lessons, give folks a chance to plug in to what we’re studying from a different perspective, or just include a “little something” that I find interesting. Because I can’t really do additional research while aboard this vessel due to limited internet availability, I’ve decided that my Lagniappe section will be more like a “People In Your Neighborhood,” which we all remember from watching Sesame Street as kids. One of the challenges we face as teachers is capacity building, meaning we have to work to inspire and encourage all students to pursue any areas of learning that interest them, paying particular attention to defeating stereotypes regarding barriers to entry in certain industries. Our cruise has a pretty broad group of people aboard, so I’ll use my blog to introduce you to “the people behind the science” in this section. The first “person in my neighborhood” you’ll meet is our Chief Scientist, Nicole Charriere. Nicole’s early interests in marine studies stemmed from her experiences scuba diving and snorkeling while visiting her mother’s family in Belize. Her love for the ocean did not waiver as she grew, and she received her undergraduate degree in Marine Biology from the University of Rhode Island. 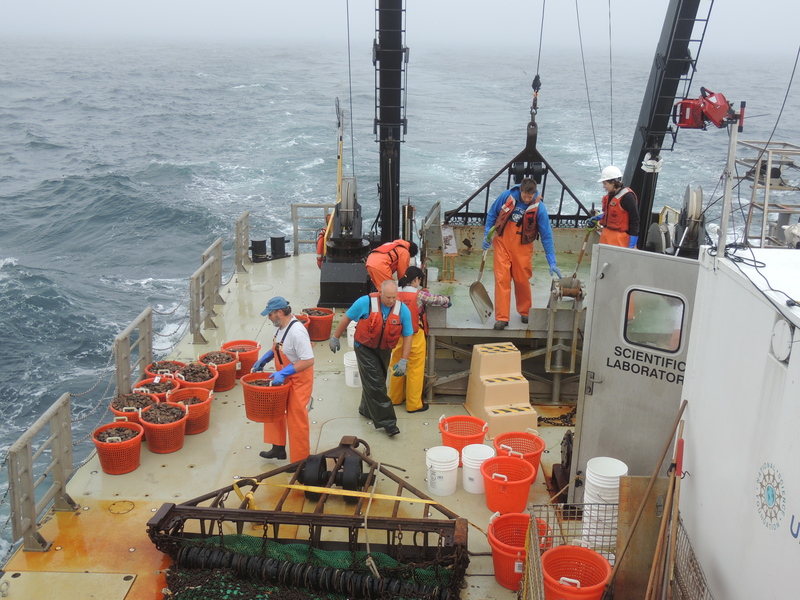 Prior to graduation, she did an internship at URI’s Graduate School of Oceanography and one of her advisors invited her to crew aboard a 29-day scientific mission to the Pacific side of Panama/Costa Rica aboard a Woods Hole Oceanographic Institute research vessel. During that experience, Nicole realized that sea-life was the life for her because it gave her a chance to be on the front end of data collection and analysis for a broad spectrum of scientific missions, while simultaneously working with a diverse group of people from around the world who were passionate about their work. 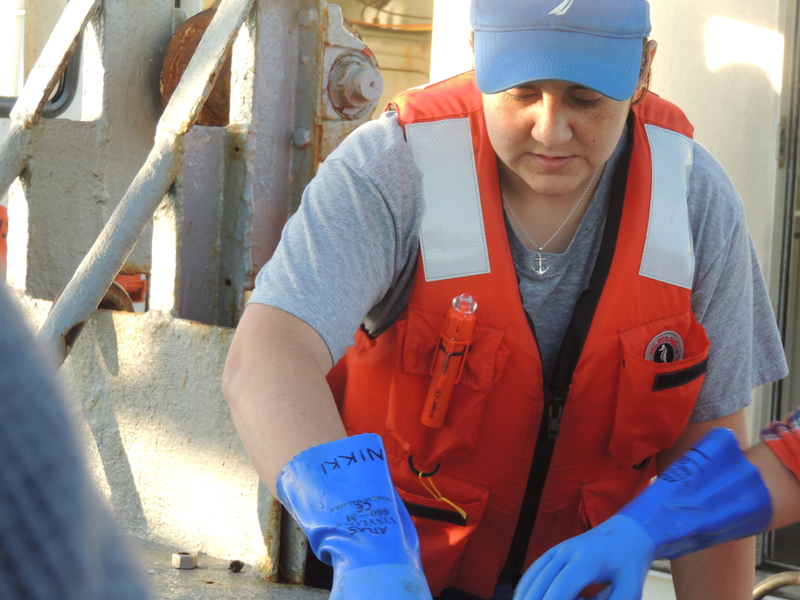 She’s been working aboard vessels for several years, with her recent work centering primarily on scallop and shellfish surveys and other research experiences aboard the R/V Hugh R. Sharp, NOAA Ship Henry B. Bigelow, as well as on commercial vessels. Her career keeps her at sea between 130-140 days per year. As the Chief Scientist, she is in charge of the flow of scientific operations, meaning she oversees the scientific operations, helping to insure that the equipment needed to conduct the studies is available and in working order (obviously, the salt-water, constant-motion, marine environment requires you to be ready and resourceful! ), makes sure that the relationship between the ship’s operational crew fits with that of the science party, and (where I’m concerned) helps to coordinate a fair transition to understanding your role as part of the working team aboard a vessel. One very interesting point I learned is that there are many opportunities for people interested in research to volunteer to be part of a research team aboard a vessel, and Nicole said she rarely remembers being on a cruise where volunteers weren’t part of the crew. 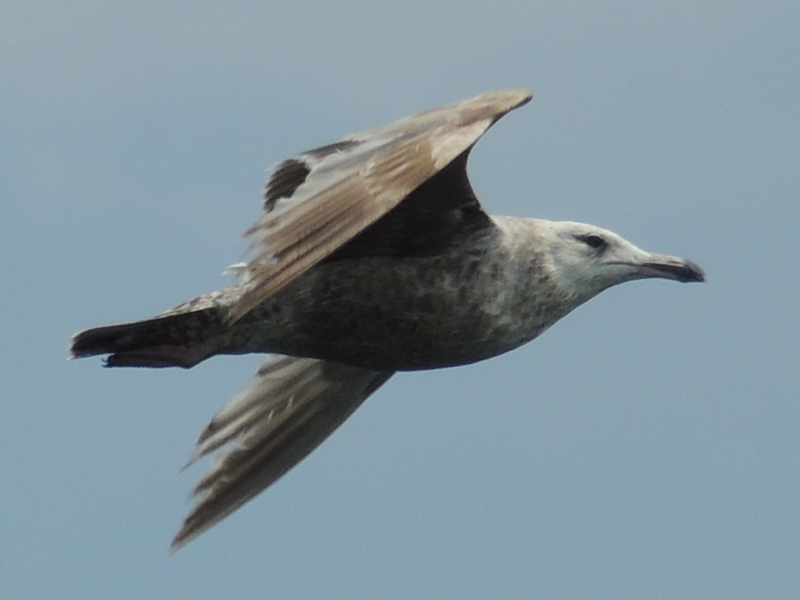 I highly encourage any students who might read my blog that have an interest in marine science to explore this opportunity while an undergrad to see if sea-life really fits with your-life! 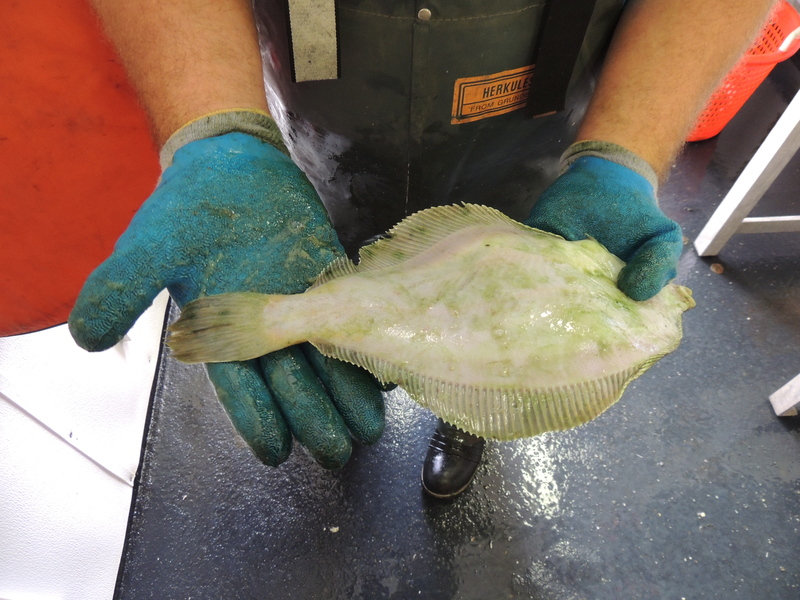 I’ll update about our dredge operations and another member of our science crew in the next blog post.